This year for Christmas my wife asked for only one thing. Believe it or not, all she wanted was a Ped Egg foot file. With a quick trip to Walgreens in response to their just-before-Christmas ads, I was able to purchase the Ped Egg for the reduced price of $9.98. A week later, naturally, they also threw in 3 replacement blades and 3 emery pads to sweeten the deal. My usual luck, I missed out on the added replacement blades, but at least I was able to meet the needs of my dear wife. And on Christmas day she was pleased I had not forgotten her one request. The Ped Egg is an egg-shaped foot file that is used to shave dead dry skin and calluses off your feet — manually, it’s not powered in any way. The hollow center holds all of the dead skin that’s been removed inside, so there is no mess to contend with. No more dry skin particles flying everywhere — like when you use a regular foot file. The file portion of the Ped Egg has a surface that is covered in small scalloped holes — similar to a small cheese grater. As you rub it back and forth across an area of dried skin on your foot, it will shave off small bits until you have removed the calloused area without damaging the soft skin that is hidden beneath the hard skin buildup. The lower portion of the egg (which, in effect, is the storage container) has a sandpaper surface (the emery pad) for final smoothing — after the majority of dead skin has been removed. The actual cutting surface is easily removable — both to allow emptying of the dead skin and to facilitate replacement with a new blade. With modest care, this podiatry tool could last indefinitely — because there are no moving parts and the only wear surface is interchangeable. The manufacturer recommends using the Ped Egg foot file only on dry, clean, and non-moisturized feet. Better Than Traditional Foot Care Tools? When compared to a pumice stone, the Ped Egg is more effective. 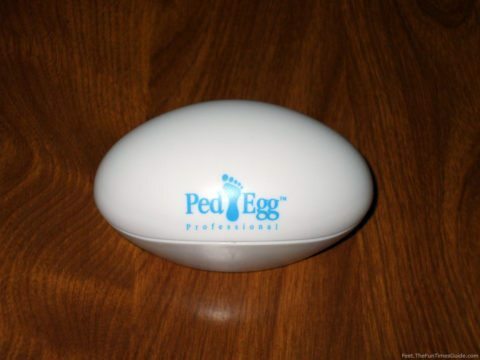 Plus, the Ped Egg contains the mess so you don’t have particles of dry skin flying all over the place. If the sight of little crumbs of your feet is offensive, then you can disassemble the Ped Egg with your eyes closed — it’s that simple. Dump the crumbs in the trash, and the unsightly mess is gone. The Ped Egg foot file is far safer than razor callus removers. With better control, you’re less likely to remove more skin than you intend to. Also, callus razors can’t follow the contour of your foot — so it’s easier to injure the skin to the point of bleeding. There are both positive reviews of the Ped Egg from people who loved the product and negative reviews of the Ped Egg from people who were less than satisfied with the product. While researching the product to see what others thought of their Ped Eggs, one thing became clear. So, after all this research, is my wife satisfied with the results after using the Ped Egg foot file? I can truthfully report that yes, she is quite satisfied with the simple Ped Egg for removing dry skin on her feet. It performs quite well and is constructed well enough to be considered a quality product. After all, in this world of throw away electronic devices costing hundreds of dollars, to be able to find a tool that performs exactly as advertised for around $10 is truly a good deal! From the original Ped Egg manufacturers, there’s the Ped Egg Power (which runs on batteries) and the PedEgg Powerball (which has a rechargeable battery). From Amope, there’s the Pedi Perfect electronic foot file — which is battery-powered. From Emjoi, there are several sizes and versions of the Micro Pedi callus remover — both battery-powered and corded with a rechargeable battery. From all the reviews I’ve read, the Amope Pedi Perfect seems to be the most highly rated (and most popular), followed by the Emjoi Micro Pedi, and then the Ped Egg Power models.